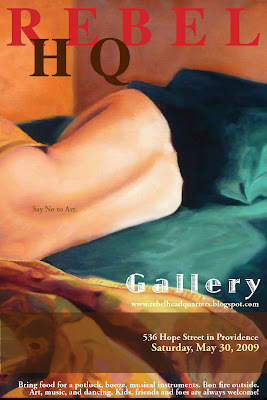 Celebrating First Anniversary of the Rebel HQ monthly gallery show on Saturday, May 30, 2009, starting at 5 pm! Wayne Bridge and Dorota Streitfeld are the host artists; and Rich Streitfeld is our host of honor and whimsy, bank of information and network advice. All art is offered for sale, discussion, comments and ice breaking. Important policy change: Children are NOT allowed on fence from this time on, even if Woody says it’s ok :)) Or at the fire pit unattended by their parents. Thanks so much to everybody for supporting this special night. And huge appreciation to Dale Donnelly and Claudia Summers for cleaning, cleaning, cleaning during the event! 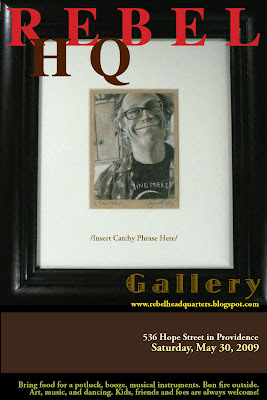 Feel free to visit: www.RebelHeadquarters.blogspot.com, where you will also find tons of photographs from the events. And as usual kindly forward the invitation to friends and foes! Looking forward to seeing everyone. Let’s say: No, Yes, Don’t Know, Whatever, to Art. Together! This entry was posted in Uncategorized on May 16, 2009 by dorota.